2014 Marked the Centennial of the Komagata Maru Ship. 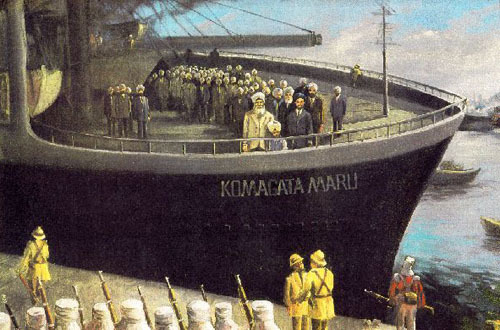 Komagata Maru >Critical Thinking : Relevance of the incident today? The arrival of the Komagata Maru had a convulsive effect on the city. There was already deep-seated prejudice against non-white residents in the area, mostly Chinese and some Japanese. Anti-Oriental riots had occurred as recently as 1907. That was also the year 901 Sikhs had arrived in Vancouver aboard the Canadian Pacific steamer Monteagle. Many white residents—particularly those who felt their jobs were threatened—decided the new arrivals must be prevented from getting off the ship. They had a lot of official sympathy. The federal government was pressuring steamship companies to stop selling tickets to Indians. In 1907 Ottawa passed a bill denying Indians the right to vote. They were prohibited to run for public office or serve on juries, and were not permitted to become accountants, lawyers or pharmacists. The provincial government had passed laws specifically intended to discourage their immigration. They had to have at least $200 on their person to enter British Columbia—the average Indian earned about 10 cents a day—and they had to have come via direct passage from India. The Komagata Maru had not left from India. She had departed April 4th, 1914 from Hong Kong with 150 passengers, picked up another 111 in Shanghai four days later, 86 more on the 14th at Moji in Japan and a final 14 at Yokohama. Then she headed to Canada. The ship’s journey was intended as a direct challenge to BC’s exclusionist laws. She had been chartered by Gurdit Singh, an affluent Hong Kong businessman. Word of the ship’s approach reached Canada and newspapers picked up the story. The Province newspaper headlined its report “Boat Loads of Hindus on Way to Vancouver.” (To white Canadians, it seems, all Indians were Hindus.) Other headlines referred to a "Hindu Invasion." Indians who already lived here began to gather and discuss how to help the new arrivals. On May 23, seven weeks after she left Hong Kong, the Komagata Maru arrived in Vancouver. Canadian and BC authorities were waiting for her. They refused permission for the passengers to leave the ship, saying it had not arrived via direct passage from India and most of the passengers did not have the $200 required to enter British Columbia. They repeated their demand that the ship leave. The passengers refused. Vancouver mayor Truman Baxter organized an anti-Asian rally, and the first speaker was the prominent politician H.H. Stevens. “I have no ill-feeling against people coming from Asia personally,” he told the crowd, “but I reaffirm that the national life of Canada will not permit any large degree of immigration from Asia . . . I intend to stand up absolutely on all occasions on this one great principle—of a white country and a white British Columbia.” Stevens’ speech was followed by “thunderous applause.” In June a board of inquiry found all the passengers inadmissible. But without supplies for the return voyage, the ship would not leave. Finally, the new Royal Canadian Navy—in its first official task—was called in. Its ship, an elderly training vessel, HMCS Rainbow, entered Burrard Inlet July 21 and trained its six-inch guns on the Komagata Maru. (This was the first appearance of an RCN vessel in Vancouver.) On July 23, 1914—exactly two months after she had arrived—the Komagata Maru was forced to leave the city. Some 20 of its passengers who already had resident status had been allowed to disembark. The more than 300 others had to return. This incident naturally raised tensions among members of Vancouver's Sikh community. Some had a particular enmity for Yorkshire-born William Hopkinson, a local immigration official, who had once served on the Calcutta Police Force—and who had an affinity for Indian languages. He spoke Hindi fluently, and could get by in Punjabi. Hopkinson had come to Vancouver in 1907, and was hired by the Canadian Government as an immigration inspector and interpreter. He was also monitoring the activities of East Indian extremists living in British Columbia, and developing a network of pro-British Sikh informants. (He also apparently disguised himself as a Sikh named Narain Singh, and gathered more information in this way!) He had been one of the men aboard the Sea Lion. On October 14, 1914 a man named Mewa Singh—a supporter of India's independence movement—shot Hopkinson to death at the provincial courthouse in Vancouver. Mewa would be hanged January 11, 1915 for the murder. A hall in the Ross Street Sikh Gurdwara is named for him. The Guru Granth Sahib could be described as the scripture of the Sikhs. They hold the book in great reverence and treat it with the utmost respect. The British officials refused this request and repeated their insistence that all the passengers would be put on the train to Punjab. The passengers rebelled and began to march toward Calcutta. They were forced back to Baj Baj and ordered to board the ship again. Led by Gurdit Singh, they refused. A police officer attacked Singh, but was stopped by another passenger. Then gunfire broke out. Twenty passengers were killed, another nine were wounded.